I used to do this lab when I taught freshman integrated science and thought that it would be a great activity to do with my son. 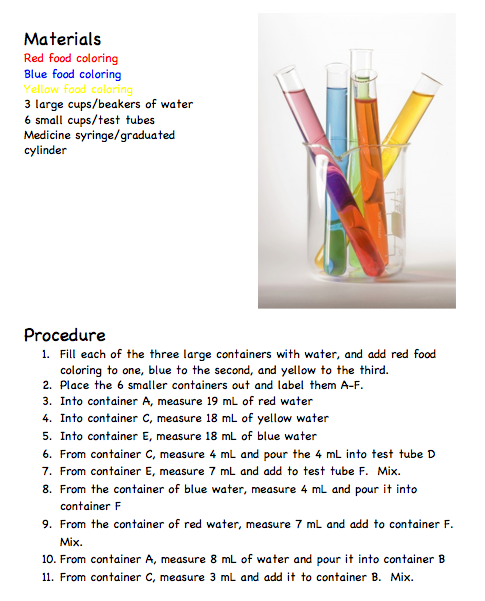 I changed it up a bit so I could focus more on primary and secondary colors and numbers (not so much measuring-if you have an older child who can focus on precision, have them measure the proper amount, at the end of the activity all of their containers should have the exact amount of substance). This is such a fun activity because you can teach your little one about primary colors (red, blue, and yellow) and when they mix with other primary colors they make new (secondary colors); like orange, green, purple, pink, etc! It is so much fun, they learn their colors, how to recognize their letters because the containers are labeled, and they practice counting, measuring, and depending on what you use to measure with, adding as well. I suggest using a medicinal syringe if you don't have access to a graduated cylinder (educational supply stores like Lakeshore Learning usually carry some). Have fun!